Offering you a complete choice of products which include plastic ziplock bags, pe zip lock bags, pe zip lock bag and plastic ziplock bag. 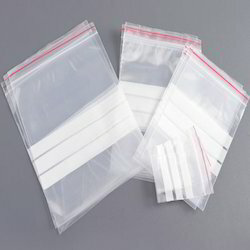 We put forth a range of Plastic Ziplock Bags with Writing Panel which provide space for writing (or a paper slip) on panels for the purpose of cataloging stored goods. This helps in maintaining organized storage and is furthermore helpful in timely retrieval of the same. Our bags come in diverse designs and are also designed in accordance to requirements of customers. 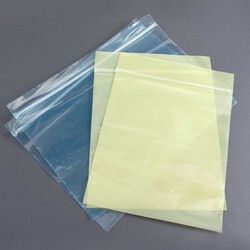 We bring our clients with our proficiency a huge collection of poly pack PE Zip Lock Bags with smooth sliding options. There is a great demand for these for making pouches and is manufactured using very high quality raw material like woven PP. Better quality products and reasonable pricing are their striking features. Looking for Plastic Ziplock Bags ?